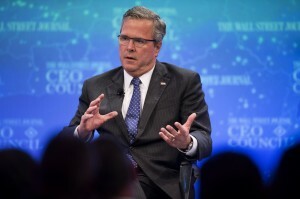 MIAMI — As he takes steps toward a presidential run, Jeb Bush is resigning from the board of Tenet Healthcare Corp. The health care company said in a regulatory filing Wednesday that the former Florida governor told Tenet’s board of directors that he would step down at the end of the year. Bush has been a director since 2007. The move comes as Bush explores a presidential run and unwinds some of his business commitments. A Bush spokesman said last week that the potential Republican contender will leave his advisory role with British banking giant Barclays by Dec. 31. Bush’s ties to Tenet, as well as other financial firms, could complicate a potential campaign. The health care giant supported and promoted President Barack Obama’s health care law, which remains deeply unpopular among the conservative activists who play an outsized role in presidential primaries. In its filing this week, Tenet noted that Bush is “not resigning on account of any disagreement” with the company. Advisers have long said that Bush would review his business ties should he run for president. Opposition researchers in both parties have already begun sifting through his connections seeking fodder for attack. According to corporate filings, Bush sits on the boards of three other companies – Rayonier Inc., Empower Software Solutions and CorMatrix Cardiovascular Inc. – and is chairman and manager of Britton Hill Holdings, a Florida-based private equity and business advisory group. While some strategists have said Bush’s private-equity work could open him to some of the same criticisms that dogged the GOP’s last presidential nominee, business executive and former Massachusetts Gov. Mitt Romney, Bush himself has said his business record would be an asset in a campaign.